Our beloved Joe passed away on March 31 of 2012. Our June 2012 Featured Artist will be a Retrospective of Joe's life and works. Joe has been creating artwork professionally since 1980. His work runs the gamut from murals, easel paintings and prints to bronze and ceramic sculpture. Since 1981, the Chameleons Garden has been a studio space for Joe Cotter and his partner, artist Kolieha Bush. Originally a grocery store, the Chameleons Garden houses the paint and supplies for the Artback Artists Cooperative in Estacada as well as providing a space to store costumes and construct sets for the Performing Arts Group of Estacada (P.A.G.E.). The building was the site for several collective art shows in the late 1980’s and early 1990’s. In 1998, Joe was commissioned by Mike McMenamin to create a life sized bronze cast sculpture of Jerry Garcia for Edgefield in Troutdale. 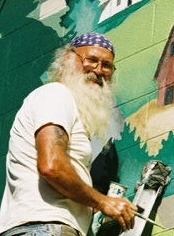 Work on the piece commenced in December of 1998 at Joe and Kolieha’s studio in Estacada. The original was completed in May of 1999 and the foundry, Burning Palace Bronze, fabricated the mold at the Estacada studio. The piece was cast at the Boring foundry and sited at Edgefield that summer. Joe studied ceramics in a class conducted by Am Griswold at the Estacada Community School in late 1999. Since that time he has created many ceramic pieces from masks and figurative to abstract and low relief. His most recent pieces are semi figurative and stark white clay with bronze glazed edges against a black background. These pieces are framed and hang on a wall. Recently, Joe has painted on abstract ceramic forms and framed them for wall pieces as well. “Artback” since 1994. There have been 14 Artback murals painted in Estacada since that time. Some of the major examples of Joe’s artwork can be found at the Crystal Ballroom, McMenamins Edgefield, Suburo’s Sushi House Restaurant in Sellwood and the Reservation Center for Parks and Recreation on the first floor of the Portland Building.